Next concert is on Tuesday 5th June 2012 at 19.30. 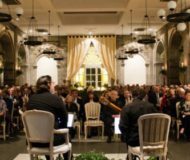 A “Double Play” organised by the artistic director of the Centre of Early Music “Pieta de Turchini” at the Grand Hotel Cocumella, Sant’Agnello (Sorrento). Neapolitan songs, Portuguese music and Brazilian rhythms are just some of the themes at the heart of “Music from the South”. The concert will be performed by the accomplished duo Mauro Squillante (mandolin) and Sante Tursi (guitar) who have been active on the scene for more than ten years. “Music from the South” is their latest project was the inspiration for this special evening at the Cocumella. A CD of original compositions and transcriptions taken from the vast bank of ethnic-influenced music is soon to be released. “Double Play” concertgoers also have the possibility to book a table for dinner after the concert at the Cocumella’s restaurant “La Scintilla”. Head-chef Carlo Matarese has created a special tasting menu for the occasion.